Would you like to spend an hour with an expert on how to build a vibrant parish? Our webinars feature one hour conversations with practitioners and experts, focused on topics relevant to making Dynamic Disciples. These are a great opportunity for staff development and equipping volunteer leaders. Each webinar concludes with live Q&A. See upcoming topics or register to view all of our previous webinars below. Sign up for the PARISH CATALYST NEWSLETTER so you don't miss any of these great events! Personal discipleship is the foundation of parish life. We will identify 5 characteristics of a Dynamic Disciple and how parishes can help them develop. We are all called to share our faith, but for many it is a difficult, even scary task. This webinar will share some great tools and ideas for equipping disciples for everyday evangelization. Do you struggle to keep families involved in parish life after a sacrament? Learn from leaders that are finding success in helping families discover the joy of parish life. To view previous webinars, simply register by clicking HERE. You will gain access to all webinars and resources. Learn best practices and ideas to ensure that every visitor to your parish has an unforgettable experience. Featuring Maryanne Russell – St. Brigid Parish, San Diego, California. Leading a multi-cultural parish has unique challenges and opportunities. We discuss his research, best practices and new ideas for making disciples in a multi-cultural environment. 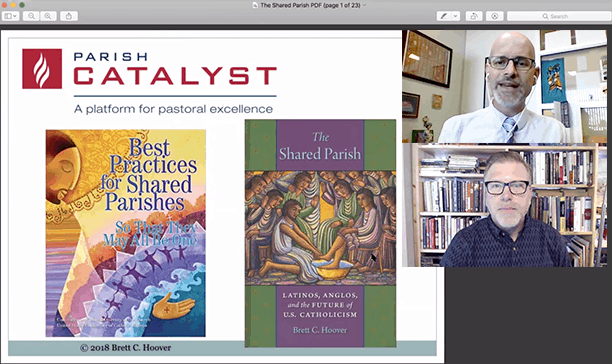 Featuring Dr. Brett Hoover – Author of “The Shared Parish”. Better understand emerging generations and effective strategies for reaching them. Featuring St. Mary’s Press CEO, John Vitek, author of “Going, Going, Gone: The Dynamics of Disaffiliation of Young Catholics”. What if those who only come to mass a few times a year had such a great experience that they wanted to come back? Gain vision and practical tools for connecting with Easter and Ash Wednesday only Catholics. Featuring Deacon Chris Hulbert – St. Brigid Parish, San Diego, California. Gain vision and learn practical steps to developing thriving small groups at your parish. Sister Terry Rickard from Renew International joins us to share Six Key Principles for Growing a Small Groups Ministry.